They like to keep them at an arm’s length (or further), after all Aquarius is the sign of objectivity and its near impossible to be objective when feelings are in the mix. This is not to say that Aquarians don’t care. Quite the opposite, they care very deeply. Aquarius is the sign of the Common Good, so not only do they care, they care about everyone. They want fairness and equality for all people, Democracy is an Aquarian ideal, brought into human consciousness within a decade of the discovery of Uranus, the planet that rules Aquarius. Aquarians are out of the box thinkers. They often feel isolated because the way they think is so unusual. Aquarians think in a very abstract way. It doesn’t always make sense to other people, but there is genius in Aquarius, and, a little madness. 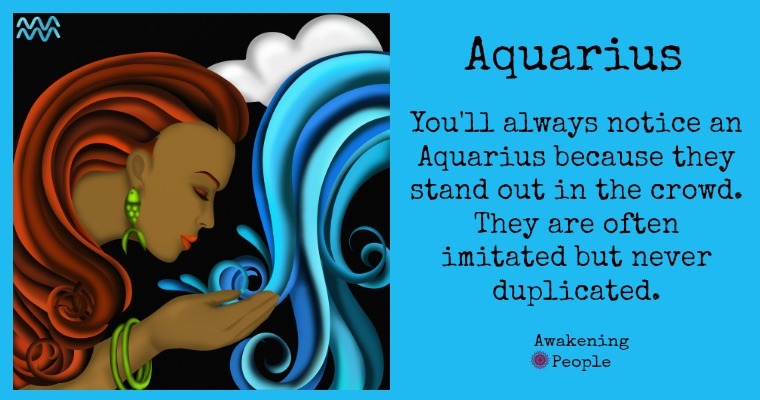 Now you may be saying, well that’s fine and dandy, but that doesn’t sound like the Aquarius person I know. Well, there’s a little know paradox with Aquarians, some are your ‘typical‘, out of the box, rebellious, anarchists and some are ‘by the book’, let’s stick with the tried and true, and it’s worked all along why change it? Aquarians. It’s as if some Aquarians forgot that they were no longer Capricorns! And sometimes they are a little bit of both, so within the Aquarius themselves they are constantly creating mental structures and then blowing them apart. Yet whatever type of Aquarian you have, one thing is for sure, they have a sense of humor. They will always make you laugh. They see life in such a unique way and can bust an ego like no one’s business. There’s a saying that laughter is the fastest way to kill an ego. Aquarians know this secret and love to poke at people who take themselves too seriously. This is the best type of fodder for the Aquarian’s laughter grist mill. Aquarians make wonderful friends, yet in romantic partnerships they may seem a little out of their element. Yet isn’t the best foundation for any strong relationship friendship? And after the passion fades, isn’t it friendship that keeps people together? So if you can handle the occasional zaniness that so many Aquarians exhibit, and if you can laugh at yourself, then Aquarians are the sign you’ll want to spend your time with. They’ll stand by your side and keep you in stitches for a lifetime.